A 43-year-old (ASA 2), 120 kg man is being given local anesthesia with monitored anesthesia care (MAC) for an awake craniotomy. His past history included previous surgery under general anesthesia for resection of an astrocytoma. He presented with severe seizure disorder, mainly due to further growth of the cerebral tumor. He is very nervous about having this procedure awake. 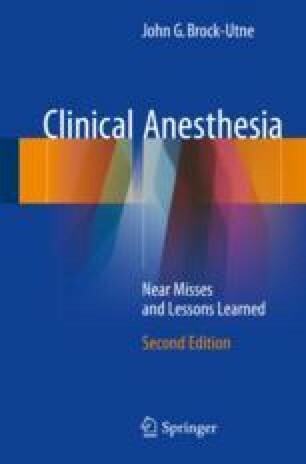 Initially, remifentanil and propofol infusion with local anesthesia provided adequate operating conditions. All sedation is turned off during the language mapping, since the patient needs to be fully alert and cooperative. The patient is now only minimally sedated. Since his face is covered with drapes, he complains of severe claustrophobia and serious lack of air. His SpO2 is 100%. Despite increasing the nasal oxygen to 10 l min and providing 15 L min of oxygen around his face from the absorber circuit of the anesthesia machine, no symptomatic relief is seen. Further sedation is not indicated since he needs to follow commands during the language mapping. His complaints are now becoming so serious that he wants the mapping and surgery stopped.